There’s a new site for job seekers that has gotten a fair amount of press recently. Glassdoor doesn’t offer job ads (yet). Instead, the focus is on trying collect and disseminate the inside scoop about a company or a given position. They do this on a give-to-get basis. Dream of being a software engineer at Google? No problem. You can find out how much that position pays, what the work environment is like and even some frank assessments of the management team. But first, you have to offer up the same information (anonymously) about your existing job. The site is pretty heavy on the tech industry right now, mostly focusing on Silicon Valley jobs and companies. Don’t look for much information (yet) about accounting jobs in Cleveland. A site like this could be insanely useful for job seekers. People have been hunting and pecking around this notion of job seekers exchanging job search intelligence for several years now, myself included. And as a founder and funder of a failed startup that tried to do a similar thing, I can tell you, the key is scale. But reaching scale is also the most difficult thing. A resource like this is only useful once it’s a repository of a large amount of data. But therein lies the catch 22. The first several thousand users will be contributing their information blindly. Once they get in, they’re inevitably disappointed because… well, they’re the first ones there, and so the information is still scarce. So, the site is not useful to the first users and this disappointment does not encourage repeat usage, or even good word of mouth. At some mythical tipping point there’s enough data in the system so that when a new user jumps through the hoop and gives their info, they’re NOT disappointed by the experience they find inside. Eventually, you hope that users are all contributing useful information and finding useful information. But that’s a steep hill to climb. As I say, this type of thing would be insanely useful for job seekers, if it works. One day, someone is going to crack this nut and it will be huge. 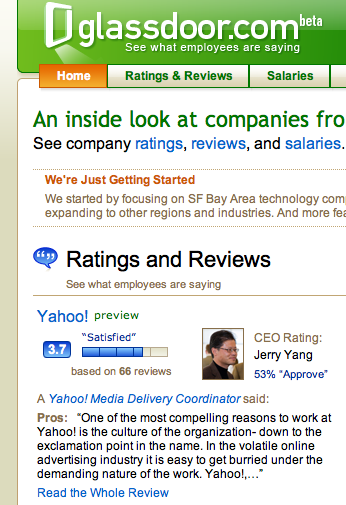 Who knows, maybe Glassdoor can do it. We’ll be keeping an eye on them. They certainly have a deep enough war chest to afford to give it a good effort.